The luxury FM7 resort is a perfect hotel to stay in between two flights. 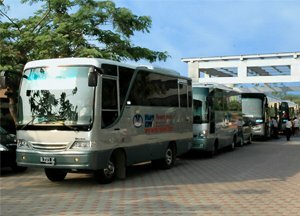 It’s at a short 30 minute-ride from Jakarta airport. All spacious comfortable rooms are equipped with AC, telephone, TV, bathroom, hair-drier, slippers, coffee and tea-facilities, minibar and safe. Restaurant, swimming-pool, 24-hour reception, safe, room service, gift shop, laundry service, sport-facilities, spa, karaokebar, free shuttle bus from and to the airport.